Today in my few spare minutes, I decided to whip up a batch of gluten free cupcakes using the Betty Crocker Devils Food Cake Mix and Vanilla Icing. *After sampling these gluten free cupcakes, I must say that they are really very delicious! They taste like actual cupcakes! Good job Betty Crocker! A few months ago, when I wrote about the restaurants and products of Paris, France, I mentioned Laduree as a great place to get macaroons. And although, nothing beats their macaroons, there are still a few places in NYC to get good macaroons. French macaroons should be gluten free, however, always check with the restaurant to ensure that they did not add any gluten ingredients. The other day, I came across a place on the upper west side of NYC called Silver Moon Bakery. Here they have an assortment of french macaroons. The great thing about this bakery is that they sold the macaroons in both large and small sizes. They come in a variety of flavors including blueberry, raspberry, chocolate, vanilla, etc. Another great place in NYC to have macaroons is at Payard Patisserie. Payard sells the small macaroons in a variety of flavors including raspberry, chocolate, vanilla, coffee, blueberry, and pistachio. However, the flavors do change from time to time. One of my favorites foods used to be matzo. However, once I started on a gluten free diet, I had to say goodbye to this snack. But, now I can enjoy matzo again thanks to Barkat's Matzo Crackers! Their delicious matzo is vegetarian, kosher, gluten free, dairy free, egg free, nut free, and yeast free. It is manufactured by the company Gluten Free Foods LTD in the United Kingdom. 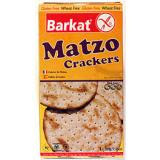 In addition to matzo, Barkat also produces a great assortment of gluten free pastas, breads, pizza crusts, cookies, baking mixes, biscuits, crackers, ice cream cones, wafers, cereals, pretzels, and tea cakes. For more information, and to find out where they are available near you or online, visit their website at www.glutenfree-foods.co.uk. Since 1988, Pamela's Products has been creating delicious gluten-free foods! One of their products, that they were generous enough to let me sample are their Simplebite Mini Cookies. Even better is that they contain all natural ingredients and no hydrogenated fats! They are truly a crunchy and tasty snack! In addition to being gluten free, Pamela's Simplebites Mini Cookies are Non-Dairy and kosher. And for 120-140 calories in about 4/5 cookies, these are a healthy snack too! To purchase Pamela's Simplebites and other Pamela's Products, visit Ms. Celiac's Market! For more information on Pamela's Products, visit www.pamelasproducts.com. And don't forget to enter Pamela's Products 2009 Greatest Gluten-Free Recipe Contest at www.pamelasproducts.com! After a week long hiatus, Ms. Celiac Says is back with an assortment of great gluten free news planned for you this week! So, let's get to it! I usually avoid going to Trader Joe's as the crowds at the NYC Union Square location scare me out of the store. I don't have the patience to try to maneuver my way up and down each aisle and normally feel that I can't even find that large of a gluten free selection. But last week, I forced myself to walk into the store and really take a good look around and now I get it! I completely understand everyone's Trader Joe's obsession! First of all, the prices are amazingly cheap! I'm used to shopping at Whole Foods or other health food stores and I was at a loss for words when my items were all rung up at the cashier. For the same items at Whole Foods, it would have easily cost me double. And at Trader Joe's even though the prices are so cheap, you're not skimping on quality either. Pretty much everything I bought was organic! They do have quite a selection of foods that are gluten free too! I purchased their gluten free french rolls which when toasted were absolutely delicious! I also purchased these delicious gluten free bean chips to dip in a gluten free garlic hummus! For sweets, I got some delicious apricot and raspberry fruit leathers! Another thing I loved about Trader Joe's was their selection of frozen vegetables. At Whole Foods, I usually just end up purchasing frozen broccoli as there really isn't much else available. But here I was able to get frozen asparagus and frozen artichoke hearts along with some delicious edamame. If you visit Trader Joe's website, www.traderjoes.com, they provide a list of their gluten free products to download. In addition to some of the products I purchased, they also have a gluten free brownie mix and a gluten free pancake and waffle mix. They have gluten free ice cream bars, gluten free ice cream, gluten free chocolate dipped bananas, gluten free sorbet, gluten free chocolate, gluten free candies, gluten free cookies, a gluten free flourless chocolate cake, and gluten free pancakes! For more information and to find a location near you, visit their website at www.traderjoes.com. Whenever I go out to Long Island, there are two grocery stores that are on the top of my list to stock up on all my tasty gluten free essentials (aka treats). These are Sherry's: The Healthy Gourmet in Babylon Village and Uncle Giuseppe's in Smithtown! Sherry's is a small health food store with the majority of their market devoted to gluten free items. They have an amazing frozen food section filled with products by Kinnikinnick, The Grainless Baker, Foods By George, Amy's, Celiac Specialties, Gillian's, etc. They are constantly getting new products in so it's great to go back their frequently to try everything out. They also carry an assortment of other gluten free non-frozen products by brands such as Pamela's, Enjoy Life, Ener-G, Nana's, Glutano, Glutino, etc. Another great place to go for gluten free products is Uncle Giuseppe's Marketplace. They have locations in Smithtown, Port Washington, and East Meadow. I've been to the location in Smithtown several times to pick up some tasty gluten free Kinnikinnick donuts or some gluten free cupcakes from The Grainless Baker. 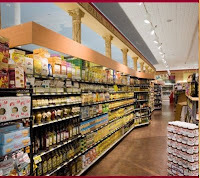 This place is much larger than Sherry's, it is the size of a traditional supermarket but is really a replication of an Italian Market with homemade pastas and gelato along with a large selection of products important from Italy. Their gluten free selection is amazing! A natural food store that rivals Whole Foods on Long Island is Wild By Nature. Wild By Nature has 4 locations: East Setauket, Huntington, Hampton Bays, and Oceanside. They offer a wide selection of natural and organic products. They also have a very large section of the store devoted to gluten free products. If you are on Long Island and need to stock up on some gluten free groceries, I definitely recommend visiting Wild By Nature. It is open 7 days a week! Although Nassau County definitely has an abundance of gluten free restaurants, Suffolk County has a few too. Two of them are Mama's Italian Restaurant in Oakdale and Buona Sera in Smithtown. + A wide selection of pasta dishes with a choice of either spaghetti or ziti. Mama's also has a great selection of gluten free desserts. My favorite is an individual sized round chocolate cake sprinkled with powdered sugar! Another restaurant in Suffolk County that I just recently discovered is Buona Sera Ristorante and Pizzeria in Smithtown. They offer a gluten free menu that includes items such as stuffed shells, chicken fingers, ravioli, spaghetti and meatballs, baked ziti, garlic bread, mozzarella sticks, eggplant parmigiana, gnocchi, and a wide selection of pasta dishes. They also serve some delicious gluten free bread to start with and offer gluten free pizza on their menu with the crust from the Still Riding Pizza Company! In addition to their excellent menu, they also have a great variety of gluten free desserts including apple pie, blueberry pie, chocolate chip cookies, brownies, cannoli, etc. And on Monday and Tuesday night it is Pasta Night which means you can get 1 gluten free pasta entree + coffee, tea, soda, or house wine + gluten free salad + gluten free dessert for only $15.50! Nassau County on Long Island has an abundance of restaurants that cater to a gluten free clientele. One of the first restaurants that I went to once being diagnosed with Celiac Disease, was Caffe Baldo. Caffe Baldo is an Italian restaurant located in Wantagh, New York. They have an assortment of gluten free items including garlic knots, mozzarella sticks, baked clams, calamari, pizza, ravioli, stuffed shells, pasta dishes, bread, cookies, cakes, etc. Visit them at 2849 Jerusalem Avenue! Another great restaurant is Cafe Formaggio in Carle Place, New York. They have a gluten free pizza (the crust is from Still Riding Pizza Company) with a variety of toppings to choose from. In addition to this they have a large menu of gluten free pasta dishes and desserts! For more information, visit www.cafeformaggio.com. With locations in Mineola and Belle Harbor, New York, Plum Tomatoes Pizzeria Restaurant offers gluten free pizza (crust from Still Riding Pizza Company) along with a selection of gluten free pasta dishes! For more information, visit www.plumtomatoespizzarest.com. And my absolute favorite place to go for gluten free pizza is Villa Milano in Manhasset, New York. It is located at 168 Plandome Road. They also use the Still Riding Pizza Company crust but I absolutely love their sauce and cheese! So, go check out these restaurants! Today, June 1st, we start the beginning of our week long feature on the bakeries, products, restaurants, and stores of Long Island, New York. Whether you're on your way out east to the Hamptons from NYC and want to stop for some gluten free cuisine or you simply want to make an exclusive trip to Long Island to sample all of the gluten free products, you want to keep an eye on Ms. Celiac Says this week! A few years ago, I first found out about the East Meadow Bakery, Sweet Karma. I was on the search for finding out where Joan's Gluten Free Great Bakes Bagels and English Muffins were for sale and had heard that this bakery was selling them. I began to frequently make a trip to this bakery to pick-up a variety of gluten free bagels and english muffins. On one of my trips, I learned that the bakery was starting to make gluten free cakes for special occasions. Since, my birthday was coming up I decided to get my cake from here. It was the first time in quite a while that I ended up having a cake that looked like a real birthday cake. It was beautifully decorated with flowers. To this date, I always get my birthday cake from Sweet Karma Bakery! In addition to these individual cakes, you can also purchase gluten free brownies, gluten free chocolate and vanilla cupcakes (with or without frosting), and gluten free pizza crusts. The pizza crusts are available in plain, sesame, and parmesan. For special occasion cakes, just give them at least 48 hours notice and you will have a long list of combinations to choose from. First you can choose if you want Chocolate Cake or Yellow Genoise (Spongecake). And then they have a wide range of fillings to choose from including cannoli with chocolate chips, chocolate mousse, fresh fruit, vanilla custard, chocolate pudding, truffle, etc. For icing, you can choose from whipped cream, buttercream, or rolled fondant. For more information, visit www.sweetkarmadesserts.com!